As the old curse goes, we are living in interesting times. While we in the Gulf deal daily with the continuing impacts of the BP oil drilling disaster, there have been devastating tornadoes in Alabama; and now the flooding of the Ohio River Valley--followed by flooding of the Lower Mississippi. The Army Corps has opened 28 bays of the Bonnet Carre’ today, and likely opening the Morganza floodway into the Atchafalaya Basin in the near future. Although there will always be multiple causes of these extraordinary events, Climate scientist Dr. Kevin Trenberth, head of the Climate Analysis Section at the National Center for Atmospheric Research, has called for the need to recognize that the warming climate is and will be one of those causes for the foreseeable future. "there is a systematic influence on all of these weather events now-a-days because of the fact that there is this extra water vapor lurking around in the atmosphere than there used to be say 30 years ago. It’s about a 4% extra amount, it invigorates the storms, it provides plenty of moisture for these storms and it’s unfortunate that the public is not associating these with the fact that this is one manifestation of climate change." Because what goes up must come down, extra water in the air means extra rain; so it’s not a surprise that meteorologists are finding regional examples of how increased air and water temperatures cause heavier rainfall. It happens that, this time, it’s our region. Meteorologist Dr. Jeff Masters has recently written that the unusually warm temperatures in the Gulf of Mexico have fed the atmosphere with such water to cause the record deluge of the Ohio River valley. The deluge of rain that caused this [Ohio River] flood found its genesis in a flow of warm, humid air coming from the Gulf of Mexico. 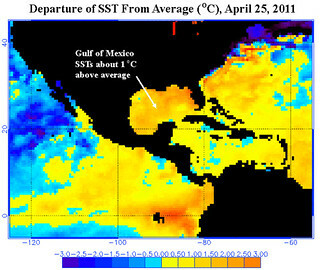 Sea surface temperatures (SSTs) in the Gulf of Mexico are currently close to 1 °C above average. Only two Aprils since the 1800s (2002 and 1991) have had April SSTs more than 1 °C above average, so current SSTs are among the highest on record. 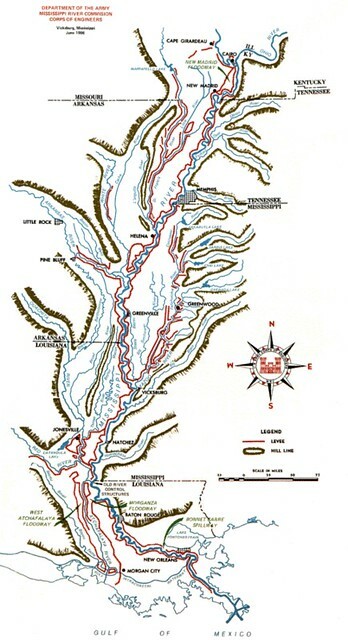 The flood has come to the Mississippi River, spurring the US Army Corps of Engineers to detonate the "fuse-plug" levee at Bird's Point by New Madrid—which has lowered the river stage at Cairo. 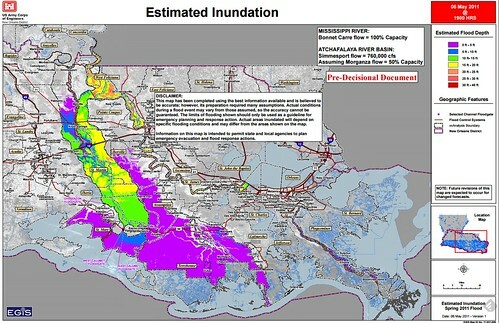 In Louisiana, worries about Baton Rouge and those of us downriver have led the Corps to consider opening the spillways, including the Bonnet Carre’ (only to 100,000 of its 250,000 cubic feet per second capacity) and Morganza Floodway, which has a larger 600,000 cubic feet per second capacity. Rarely is the Bonnet Carre’ opened twice within three years, and the Morganza has only been opened once since it was constructed, in the 1973 flood that damaged the Old River Control structure upstream. Will these structures have to open more often in the future, because the regional climate has more water in circulation? Can the levee system withstand more frequent stresses from the river if flooding frequency increases? The new climate is here, so the answers are guaranteed to be interesting. This article was edited to correct Morganza's correct maximum flow of 600,000 cfs. previously, we had printed 800,000 cfs.